According to Chip Cormie, this car was owned by Arnold Delisle, Sr.. The car was a Chevrolet body and I will let Delisle's son describes the running gear: "the engine was a air cooled 6 cyl mounted upside down with carb on the bottom and a home bell housing mated to 3 spd trans with hudson rear end. I was only a kid when my father raced so some of the details may not be right if any knows about the car i would like hear from them call me at 413 529 0150 or email me ndsuzuz@aol.com "
Arnold, Jr. goes on to say: he raced in the 50s on short tracks in Ma ,VT and N H mostly rhythm inn speedway on fri nights." 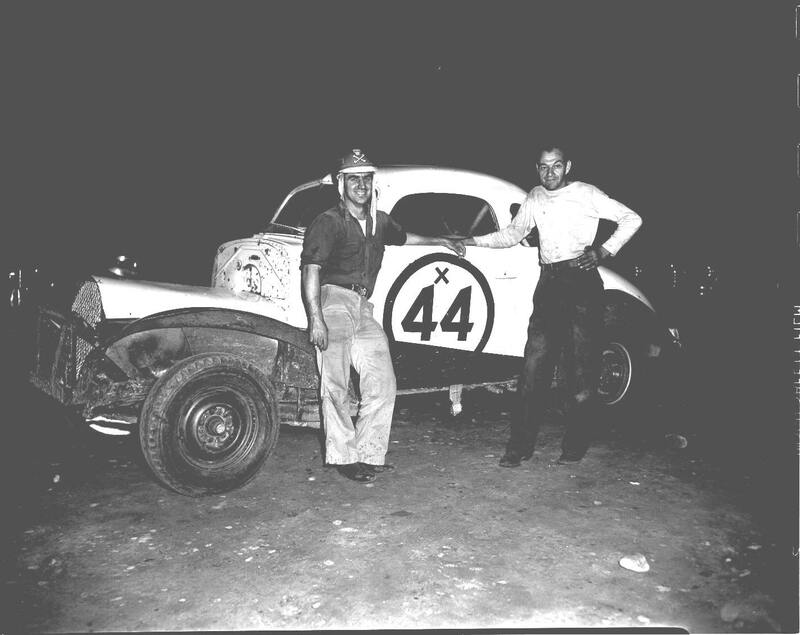 Rene Charland poses with the car and its owner, Arnold Delisle. I found my fathers x 44 on the catamount stadiums webb site . I have been looking for this car for many years. Needless to say i was surprised to see my father standing next to Rene Charland, who was only 21 at time. The caption under the picture wondered who the driver was. I sent email to the site and said the driver was Arnold DeLisle , he built the car in Northampton Ma. about 1951. The car was a 37 Chevy with a surplus Lycoming 6 cyl air cooled engine hooked up to Studebaker bellhousing with a lincoln 3 spd trans and a Hudson rearend. It had a downdraft carb on the bottom of the engine, causing a lot debris getting to the engine. It had short pipes out the front that turned white hot and shot blue flames out of them. My father built many cars but this is the one i am interested in. He raced at West Brattleboro, Riverside, Rythmn Inn Speedway and others in the area. he wasn't too successful but he caused quite a stir. 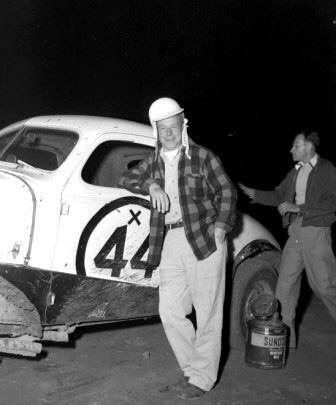 He was active in the early 50s when dirt tracks were plentiful. The car wasn't fast enough for the short tracks as the fords beat him most of the time. I don't think he cared , he just wanted to be different. I doubt if the car is still around but if any has seen or heard about the car i would like to know. I live in Easthampton Ma. My # is 413 529 0150 email ndsuzuz@ aol.com. not as unusually placed in this photo. Was it a different engine then ?